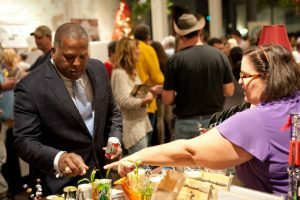 Columbia Mayor Steve Benjamin shops at the Sustainable Holiday Celebration. The Sustainable Holiday Celebration is Monday, November 28, 4:30 – 8:30 p.m. at the event hall at 701 Whaley. The celebration features local makers whose products demonstrate a commitment to sustainable materials and practices. The food, entertainment and shopping are always first-rate. Thousands of shoppers find unusual gifts and products at Crafty Feast. 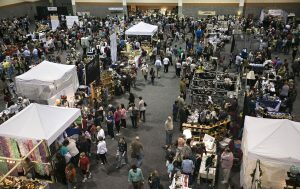 Crafty Feast is Sunday, December 11, noon – 6 p.m. at the Columbia Metropolitan Convention Center. It’s the midlands’ largest independent craft fair with over 100 vendors of high-quality handmade items. Products range from traditional to edgy, so there’s ample opportunity to find the most unique gifts here. If you can’t make it to either of these great events, there are still opportunities to have Titanic Alley be part of your holidays! We offer private shopping at our studio located in downtown Columbia. Just contact us to make an appointment to stop by. We’ll roll out the red carpet with a glass of something delicious while you browse our selection of bow ties, pocket squares and winter scarves. Then there’s our Titanic Alley web site. This time of year, our inventory of one-of-a-kind items changes so rapidly, it’s hard to offer our full range of wares online. But we do post a limited selection of bow ties for online purchase. If you’re looking for something very specific, just contact us and we’ll see if we can match you with something in our offline inventory, or make something special just for you! We hope your holidays are filled with the joys of family, sharing, giving and gathering with friends and loved ones. Let us know how Titanic Alley can make your holidays even more unique.